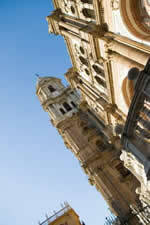 Great Almeria accommodations in nearby towns A hotel in Almeria Spain and a dream come true. When we say ´a hotel in Almeria´, everyone starts dreaming of the most luxurious four star hotels in the most enchanting places like in the highest mountain range surrounded by Iberian wildlife and secret caves and archaeological mines. Or waiting for our prince or princess if we spend the night in a medieval castle or even listen to the soft waves as they hit the shores just below your bedroom window. Waking to the coo of the seagulls and having a scrumptious continental breakfast as we breathe in the fresh sea air. And why not this and more, all part of the Almeria hotels. Living among what past civilizations have left us and enjoying the most modern accommodations, there is always a shelter for everyone´s budget and desires in a hotel in Almeria Spain. 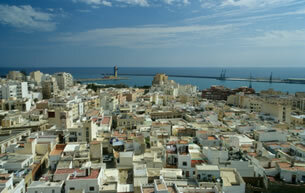 Within Almeria, we can appreciate that the port is a very attractive and privileged area to stay at. There are a few four star hotels with over 100 ample rooms and magnificent views of both the port and park area, with especially equipped convention halls for large reunions such as for business, weddings or other types of organizations and international fairs. Being that the Almeria airport is only 9 kilomtetres from the city, there is no such Almeria airport hotel on the premises but with the well planned airport transfers from Almeria airport to the city or other popular vacation villages, your stay will be comfortable and well attended. In Mojacar, Roquetas de Mar and Vera, all of which are coastal towns, we can delve into our own little world once inside one of the special seaside resort hotels. While suntanning and having your meal there, you can feast your eyes on sunrises and sunsets without having to move a finger. For golf fans, there are various holiday complexes with hotels, apartments and bungalow style housing and many extra activities for the whole family while some practise golf. From this category coming down in stars but never leaving aside comfortable lodging and friendly service, we have quite a few Almeria hotels in and around the city centre. In each of the neighbouring cities or towns like Adra, Aguadulce, El Ejido, Enix, Mojacar, Roquetas de mar, San Jose and Vera, there are at least two four star hotels. Whether your stay be in a large or small city or town, this will not be an obstacle for you to search for discount hotels in Almeria or in the whole province. Be it a hostal, a bed and breakfast or just an inexpensive hotel, we must not associate these kinds of low cost lodging with having to give up cleanliness and comfort or having to travel to remote places just to keep the budget down. Centrally located, near the port or beach area, there is a good selection to choose from. Going a little further out of the centre, near green area, they can be as low as 30 euros a night. 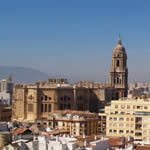 If we are truly visiting Almeria city and province to enjoys its attractions, beautiful scenery and history and eat well, then choose simple friendly discount hotels in Almeria to stay at and spend your time and money on other pleasures and on your return trip because I am sure you will be back to use your detailed map to pin point your ideal hotel in Almeria.